Depending on arrival time choose from one of the following: shopping in the Old and Center markets or day in life visit. 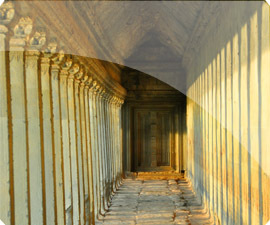 4:30pm Depart from the hotel for an evening trip to view sunset at Phnom Bakheng Hill. 7 pm transfer to your hotel . Your private temple guide and driver transport you to Angkor Thom including Bayon temple smiling faces-Baphoun temple-Royal palace-elephant terrace-. 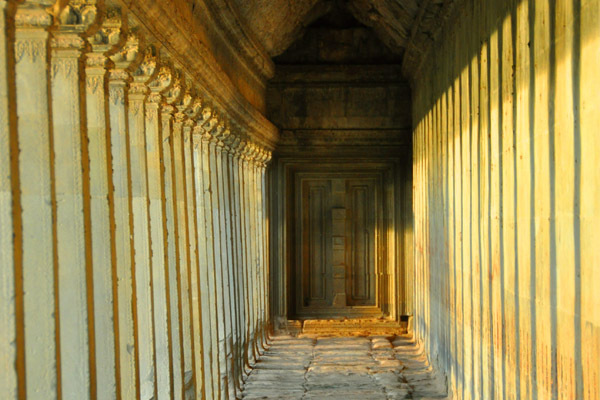 Explore this incredible monument and gain an insight into the Khmer Empire. Our guides are some of the most experienced in Siem Reap, and are committed to ensuring you get the very best out of your Angkor experience. The timing for this day is flexible. We will discuss with you the best times to miss the crowds, and your guide and driver will work with you to establish a plan that suits your individual interests and needs. Jungle Temples, Kbal Spean(sacred rivers) and local villages. Morning : tour to visit Ta Prohm (jungle temple) we will counter clock wise less crowds -Banteay Samre. in pink sandstone that covers the walls like tapestry. north east of Angkor (river of a thousand Lingas) there are several more impressive carvings in this cosmic myth,Vishnu reclines on his side on the serpent,Ananta,and floats on the ocean. his upper torso rests on his elbow a golden lotus emerges from the navel of Vishnu signifying the begining of a new cosmic period .the lotus opens and Brahma appears to preside over the new creation.the path eventually splits to the waterfall or river carving. the Far temples “Beyond Angkor” on a fully guided tour to explore some amazing sights that many tourists never get to see. Your trip takes you through local villages providing some fantastic photo opportunities. through river front villages and see Traditional fishing and farming .the river enters the Kampong Khleang Villages TonLe Sap.the largest- fresh water Lake In Southeast Asia that provides fish and irrigation-water for half The population of Cambodia,the Fishing industry - supports-About one million people in Cambodia. Where We visit a fascinating floating village with floating schools ,markets and even a floating church We can experience an unusual and unique way of life which has existed for hundreds of years . Beng Mealea has been lost in the jungle and almost forgotten by the local population, the little explored temple of Beng Mealea (XIth c) is waiting to be rediscovered by the adventurous travelers. Depart from Siem Reap by car to cover around 60 km in the Cambodian countryside, along the Kulen Mountains. Depending on arrival time choose from one of the following: shopping in the Old and Center markets or Artisans Stone and Wood center visit. This is your first day of your three day temple pass. Your private temple guide and driver transport you to Angkor Wat. Explore this incredible monument at your leisure and gain an insight into the Khmer Empire. Our guides are some of the most experienced in Siem Reap, and are committed to ensuring you get the very best out of your Angkor experience. Following Angkor Wat your guide takes you on to the ancient city of Angkor Thom. Explore temples including the famous Bayon, Phimeanakas, Royal Palace, Kleangs, Preah Pithu Group, and unlock the secrets of the Terrace of the Leper King and Elephant Terrace. Your guide will ensure you see all the best well known sights as well as those that many miss. The timings for this day are flexible. We will discuss with you the best times to miss the crowds and your guide and driver will work with you to establish a plan that suits your individual needs. Please note these temples are suggestions and we will work with you closely on where to go, and what to see. In the evening head out to town and pick up a few souvenirs at the local markets or explore pub street’s restaurants, cafes and the many galleries down it alleys and lane ways for more unusual and interesting dining experiences. We suggest an early start today heading off to Ta Prohm before the masses of crowds arrive. This is a very special temple and the early start makes for a spectacular experience. Enjoy a day of temple explorations. Visit Preah Khan – Temple of the sacred sword, Ta Som, Banteay Kdei, Banteay Samre, just to name a few. If you are feeling a little “templed out” you can choose instead to head out to The National Silk Center on the way we can visit the Pottery revival project, a small independently run project that trains local people the techniques of traditional pottery with styles based around the pottery used a 1000 years ago in the region. Then travel past rice paddies, buffaloes and local villages to the National Silk Center. Enjoy a really interesting tour of the farm includes breeding of silk worms, silk extraction process and through to see the creation of some amazing pieces. The center also exhibits some fantastic old looms as well as traditional Khmer dance costumes. You could give note books and pencils to some school-age children . Afternoon: On the way back we will stop at poor villages-Take a look daily life of the people living includes they are making-hammocks from- water hyacinth. 4 pm transfer back to hotel.